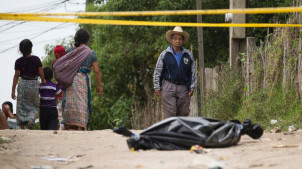 On the night starting on the 19th of September 2014, at least 15 armed employees of the company Cementos Progreso fired on people from the El Pajoques community in San Juan de Sacatepéquez, Guatemala. They were peacefully resisting the destruction of their environment by a cement plant. At least 8 people are dead, 4 injured and several families were displaced in the violence. Although the National Civil Police (PNC) was alerted, the officers did not come until the morning of the 20th. By September 22 the state of prevention (first grade state of emergency) was declared throughout the municipality, with a military presence and the PNC present in 4 villages. There are 12 communities that resist and defend the territory of San Juan Sacatepequez, to prevent the commissioning of Cement by Cementos Progreso (CEMPRO). The resistance is occurring since 2006, when the project was announced. Construction began in 2013, together with a new highway called the “Regional Ring”.Of the around 9000 people that were able to express their view on the project, 99.95% expressed their opposition to the construction of the cement factory. More information on this case is in the Atlas of Environmental Justice. The Global Alliance for Incinerator Alternatives (GAIA) strongly condemns the recent deaths.Tthere is also fear that violence will continue under the recently-declared State of Emergency. More than thirty leaders who are organizing to defend their land from pollution are now facing arrest warrants. They have been charged with crimes despite the fact that no real investigation into the incident has been carried out.